ITEM - Chicken Little was right. "With the Big Three auto makers now in a plainly visible death spiral, the automotive bailout debate is kicking into overdrive. The disagreement hinges on whether a bailout is necessary to support an important industry or whether the unprofitable dinosaurs of the past should be allowed to fail as America focuses on an information-age, service sector, and alternative energy future. As usual, both sides have it wrong. The government should let the Big Three fail not because we no longer need an auto industry, but because we desperately do. What we do not need is the bloated, inefficient auto industry that we have today. By allowing the Big Three to fail, their capacity will be turned over to new owners who will be able to acquire the means of production at fire sale prices and hire workers at globally competitive wages. The result will be a more efficient auto industry making cars that people around the world actually want to buy at prices they can afford. Such auto makers could conceivably be profitable and could become the cornerstone of a manufacturing renaissance in the United States. In contrast, Ford, Chrysler and GM are never ending money pits that threaten to swallow a good deal of our economy." "... is one that compares total credit market debt to U.S. GDP. The average of this ratio over the last 100 years has been around 155%. The ration peaked first heading into the Great Depression at 260% (after then falling back to 130%) but has now risen to an unprecedented 350%." "From the early 1920s through 1985, the average level of debt-to-GDP in this country was 155%. The highest peak in history (until the recent debt boom) was in the early 1930s, when debt-to-GDP soared to 260% of GDP. In the 1930s, the ratio then cratered to 130%, and it remained close to that level for another half century.In 1985, we started to borrow, and last year, when we got finished borrowing, we had borrowed 350% of GDP. To get back to that 155%, we need to get rid of more than $25 trillion of debt... The banks have written off $650 billion so far. So we suppose that's a start." 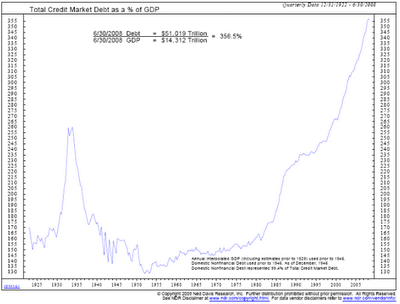 Think again about what Peter Schiff was saying about the debt that led to this crisis. Look again at that chart. Consider the solutions being pushed through Congress to stimulate the economy, bail out the big three auto makers, and subsidize keeping people in their homes. We have a problem that was created by too much government spending and lax monetary policy encouraging easy credit that precipitated too much debt, with a market distorted by the catalyst of massive government intervention to meet the social goals of permitting unqualified borrowers buy homes they cannot afford. And the solution being promoted? More government spending, loose monetary policy to provide easier debt, and much more market distortion from massive government intervention to meet social goals of propping up failed companies and keeping unqualified borrowers in homes they cannot afford. This strikes me as - what is the technical term? - batshit insane. ITEM: The President-elect inspires confidence. Kroft: "Where is all the money going to come from to do all of these things? And is there a point where just going to the Treasury Department and printing more of it ceases to be an option?" Mr. Obama: "Well, look, I think what’s interesting about the time that we’re in right now is that you actually have a consensus among conservative Republican-leaning economists and liberal left-leaning economists. And the consensus is this: that we have to do whatever it takes to get this economy moving again, that we’re gonna have to spend money now to stimulate the economy. And that we shouldn’t worry about the deficit next year or even the year after. 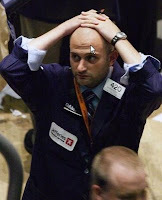 That short term, the most important thing is that we avoid a deepening recession." Well Mr. President, you might consider whether it is prudent to continue digging furiously, when we are already deep in a hole over our head. But I guess it is best not to think about that right now. After all, it won't be us, but our children and grandchildren that be repaying China for the money we are continuing to borrow to fund all this new spending. "If libertarians’ left-wing opponents have conflated free markets with pro-business intervention, libertarians’ right-wing opponents have done all they can to foster precisely this confusion; for there is a widespread tendency for conservatives to cloak corporatist policies in free-market rhetoric. 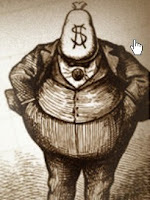 This is how conservative politicians in their presumptuous Adam Smith neckties have managed to get themselves perceived—perhaps have even managed to perceive themselves—as proponents of tax cuts, spending cuts, and unhampered competition despite endlessly raising taxes, raising spending, and promoting “government-business partnerships.” Consider the conservative virtue-term “privatization,” which has two distinct, indeed opposed, meanings. On the one hand, it can mean returning some service or industry from the monopolistic government sector to the competitive private sector—getting government out of it; this would be the libertarian meaning. On the other hand, it can mean “contracting out,” i.e., granting to some private firm a monopoly privilege in the provision some service previously provided by government directly. There is nothing free-market about privatization in this latter sense, since the monopoly power is merely transferred from one set of hands to another; this is corporatism, or pro-business intervention, not laissez-faire. (To be sure, there may be competition in the bidding for such monopoly contracts, but competition to establish a legal monopoly is no more genuine market competition than voting—one last time—to establish a dictator is genuine democracy.) Of these two meanings, the corporatist meaning may actually be older, dating back to fascist economic policies in Nazi Germany; but it was the libertarian meaning that was primarily intended when the term (coined independently, as the reverse of “nationalization”) first achieved widespread usage in recent decades. Yet conservatives have largely co-opted the term, turning it once again toward the corporatist sense." It is only when the term "free market" is severed from any historical definition or conventional meaning that the current economic crisis can be explained as a government rescue of a "free market" failure. To solve a "free market" problem that was created by too much government spending, too much government debt, too much easy government sponsored credit, and a market distorted by massive government intervention (along with a large helping of corporate criminal fraud that slipped through the regulatory framework) we are now given to understand that we need to increase government spending, government debt, and create more market distortions with more government intervention. Yeah, that should work. I feel better already. Bobo presents Bobo's Carnival of Politics - Nov 9 hosted at The Bobo Files. Thursday presents The Politics and Money Carnival #11 hosted at One Vote Matters. TBMD from The Boring Made Dull the moved his Carnival operation, and is now presenting the latest installment at The Carnival of Ohio Politics #142. I agree. And let me make a more localized point . . . Yes, of course Obama is going to keep spending more. Until someone decides to cut entitlements, which isnt likely soon, this cycle will continue. Yeah the vicious cycle continues - Our debt addicted economy continues to demand injections of ever more debt to stop feeling bad, with the pain of each subsequent withdrawal getting worse, and a demand for the next fix. Like with any addict, the cycle ends in one of two ways - A cold turkey cure, or death of an overdose. In either case, the drug use stops.